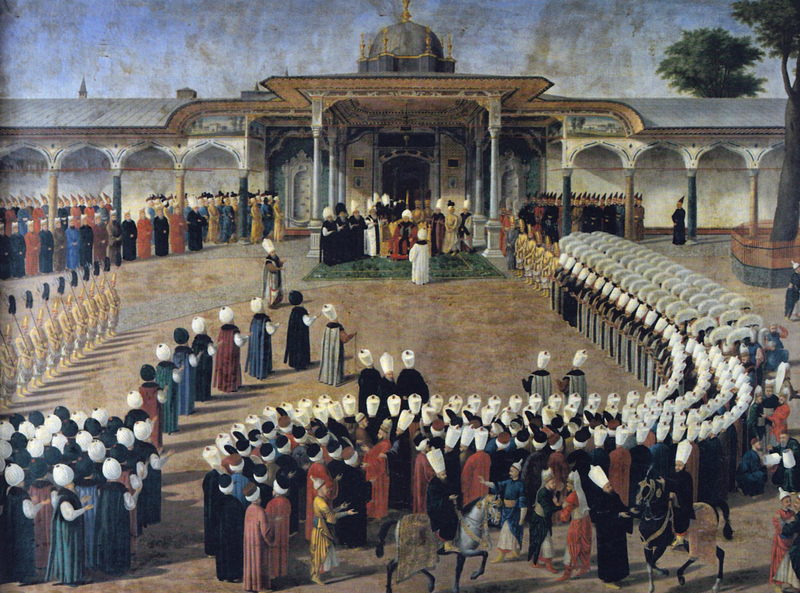 Sultan Selim III holding an audience in front of the Gate of Felicity in the Second Courtyard. I consider myself a pretty open-minded guy, but I’ll admit to relishing certain prejudices, at least when it comes to my choice of reading material. I’ll defend these to an extent. For example, I’d never go anywhere near those awful Bill O’Reilly “Killing” books (Killing Jesus, Killing Lincoln, etc. ), which by the way have sunk so low as to somehow justify the latest installment, Killing Reagan, dealing with only an attempted assassination. Between those and Sue Grafton ditching the A Is for . . ., B Is for . . . formula and titling her latest book simply X, it’s getting more and more disheartening to read the New York Times Bestseller List, which, granted, I probably would be better off not doing anyway. But as I was saying: prejudice. We’ve all got certain preformed judgments that are useful in steering us away from less savory printed matter. If only for our sanity’s sake, these judgments aren’t such a bad thing. Occasionally, though, I will venture outside of the narrow political and aesthetic confines described by the books and magazines I habitually read and seek out something different. I worry of course that there is something smugly self-reinforcing in this gesture — the occasional open-minded excursion that justifies further prejudice. For the most part, though, I’m motivated by curiosity, and that seems innocuous enough. What’s more, when I seek out an unfamiliar book, I approach it with a heightened level of skepticism, and while I do enjoy the pleasure of considering myself an objective, dispassionate judge of things, I suppose I also hope that I can maintain that skepticism towards more familiar literature as well. Such were my thoughts as I began reading Francis Fukuyama’s The Origins of Political Order. Fukuyama is still perhaps best known as the author of “The End of History?”, a hugely influential essay for post-USSR neoconservative doctrine in which he argued that, with Communism gone, there would be no ideological alternative to Western-style democracy. Fukuyama publicly broke with neoconservatism soon after the Iraq war began, but it’s a hard mantle to shrug off. I could just be projecting this, but it seems that with The Origins of Political Order, which together with a second volume, Political Order and Political Decay, forms an exhaustive examination of how political institutions developed in different societies and takes in 5,000 years of human history, Fukuyama is trying to further scrub himself clean of any particular ideological taint. The blurbs on the book jacket are instructive in this regard. The first two come from the New York Times Book Review and the New Yorker, respectively—solid center-left sources, no Economist or Wall Street Journal here. “[Fukuyama] is an original and independent mind, and his writings have never seemed to be constructed on a doctrinal foundation,” begins Louis Menand’s quote; another from Mackubin Thomas Owens reads, “Whether or not one accepts his thesis, [Fukuyama] has injected serious political philosophy into the discussion of political affairs . . .” Reading the blurbs, you come away with a pretty clear message: Worry not, Liberal Reader! The book you hold in your hands is not a work of right wing punditry but rather something more worthy of your rigorous intellect. Read on! And indeed, Fukuyama approaches his subject with such rigor and thoroughness, and writes prose with such an unimpeachably objective sheen to it, that you’d never suspect an ulterior ideological motive. The Origins of Political Order rests on Fukuyama’s assertion that political order consists of three components: strong central government, political accountability, and respect for the rule of law. Fukuyama starts by looking at tribal societies, then moves on to survey a range of major human civilizations — China, India, the Ottoman Empire, Christian Europe. He finds that certain civilizations feature governments with some, but not all, of the three key components: China, for example, developed a strong central government very early on, while lacking accountability or the rule of law; India, on the other hand, saw a much greater degree of accountability while lacking centralized authority. Independent of his larger thesis, Fukuyama’s comparative approach yields a condensed history of human civilization, and in this respect it’s highly informative and engaging: I did not know about, for example, the Ottoman Empire’s reliance on a distinct class of foreign-born slave soldiers; now I do. But when it was first published in 2011, the book did not appear in a vacuum, no more than it exists in one today. Fukuyama himself addresses the legacy of Iraq and Afghanistan in the introduction — the failure of U.S.-led efforts to establish successful political institutions in these countries provides the context for Fukuyama’s disinterested examination of political institutions in human history. In this light, what he presents as objective historical assessment comes to seem more like soul searching. All this came to seem more clear to me when, after finishing The Origins of Political Order, I began reading David Graeber’s new book The Utopia of Rules. If Francis Fukuyama represents one end of the spectrum, where I can compliment myself on my skepticism and congratulate myself for being a few shades less conservative than the author, then Graeber represents the other: Graeber’s radicalism makes me feel flaccid, middle-class, and complicit in a system whose flaws I don’t even sufficiently perceive, much less fight to counteract. In finding fault with Fukuyama’s arguments, I boost my confidence in my tepid lefty notions and bolster that part of myself that relies on those notions to help form an identity; encountering certain arguments of Graeber’s that seem less compelling to me, I’m aware of a separate defensive, conservative impulse that makes me question my skepticism — do I really disagree with him, or am I just unwilling to go that far? Though the two are different both in scope and purpose, Graeber and Fukuyama’s books overlap in interesting ways. Fukuyama’s project presents itself as objective-historical and thus apolitical, but of course it rests on several underlying assumptions, among them faith in the necessity of government, and even reverence for political institutions. Having witnessed the U.S.’s failure to impose Western-style democratic government on Iraq or Afghanistan, but still believing in its essential legitimacy, Fukuyama breaks this form of government into component parts and examines each part in various global and temporal contexts. Fukuyama thus presents, along with a defense of government, a kind of revision of his thesis in “The End of History?”: the emergence of functional government that respects the rule of law and is accountable to its citizens is contingent on a variety of historical, social, and environmental factors; it is not inevitable. But after providing 5,000 years’ worth of examples of different governments that, for a variety of reasons, either succeed or fail to congeal into Western-style democracy, Fukuyama leaves firmly in place the notion that there is no viable ideological alternative. Graeber, an anarchist, does not subscribe to this notion. His previous book, Debt: The First 5,000 Years, has a similar historical sweep to Fukuyama’s but does not affect the same neutral perspective; rather Graeber writes with overt polemical purpose. In The Utopia of Rules: On Technology, Stupidity, and the Secret Joys of Bureaucracy, Graeber takes the same polemical approach and focuses on one aspect of strong central government (one of Fukuyama’s three components, along with accountability and the rule of law), bureaucracy. In the introduction, Graeber calls for a left-wing critique of bureaucracy and offers suggestions as to what it might look like. His critique begins by highlighting how regulations on, e.g., the banking industry, only serve to prop up a symbiotic system of government-corporate graft. On their own, such assertions aren’t hugely radical; Fukuyama, incidentally, offers several of these examples as well, such as his account of venal officeholding in ancien régime France. Where Graeber’s critique really takes off, though, is in the book’s final essay, “The Utopia of Rules, or Why We Really Love Bureaucracy After All,” where Graeber directly examines the appeal of bureaucracy and the ultimately insidious effects of the dominance of bureaucratic procedure and thought. Graeber labels our current age an age of “total bureaucracy,” and his call for a left-wing critique comes from his idea that to accept a bureaucratic system of order is to reject the revolutionary imaginative force that is the wellspring of left-wing political power. Bureaucracy stifles the imagination; to accept the legitimacy of bureaucratic rule is to concede that we really do need an indifferent array of rules administered by a remote state to whom we cede power in exchange for a measure of security and efficiency; but by solidifying power in such bureaucratic mechanisms, which are only meant to serve as expedients but wind up becoming ends in themselves, you make it less and less possible to envision a world outside of a bureaucratic framework. Essentially, you deprive your politics of any real power, because the imaginative principal at the heart of your politics is incompatible with a bureaucratized world, indeed only makes sense outside of it. Something similar is at play in Fukuyama’s comparative study of world civilizations and their relative success or failure to develop political institutions like our own — he doesn’t question the framework itself. It seems there’s not much hope in Fukuyama’s project; though he insists that countries are not “bound by their history,” as he puts it, he is also intent on showing how the governments he describes as successful are the result of specific, contingent circumstance — it’s hard not to see them as historical accidents. If there are no alternatives to a system of government that arises in large part due to factors outside of individual citizens’ control, what potential for action is there, other than trying to maintain a fragile status quo? Fukuyama’s conservatism depresses me, Graeber’s radicalism inspires me but makes me uncomfortable. Really, the truth is that I’m as unlikely to join Graeber on the barricades as I am to follow Fukuyama to the Think Tank—or to academia, I suppose, since both authors currently hold positions at universities. One more thing to consider is that while I can casually pit them against one another, as I’ve just been doing, there’s something at play which I’ll call the misery of the general reader, which is that to fully engage with each of these works would require writing a work as rigorous as each of theirs, where really it’s asking a lot of me just to read the footnotes, much less investigate the additional sources they point me to. And so I’m left, basically, back where I started: skeptical and dismissive of one extreme but grateful that it’s there to define my position, and sympathetic towards the other but unwilling to act on my sympathies. Maybe the obvious conclusion to draw is that there’s only so much that can be accomplished by reading alone; that while there’s value in expanding my worldview, I should recognize that, for now anyway, the open-minded realm I inhabit is also a realm of inaction.